Full Moons are big peaks, and with ritual, you can go with the momentum. And that simply means concentrating your energy for symbolic or real action. The lunar cycle gives you many chances to do rituals to mark a personal turning point or let go. At the New Moon, you can go into the dark and be symbolically reborn. New Moon rituals help you summon your whole Self, and in that magic moment, commit to intentions. At the Full Moon, the energy builds and builds....there's an explosive outgoing aspect to it. All of nature grows and is more vital at the full Moon. This surge allows you to take action on behalf of those new Moon intentions you set two weeks prior. 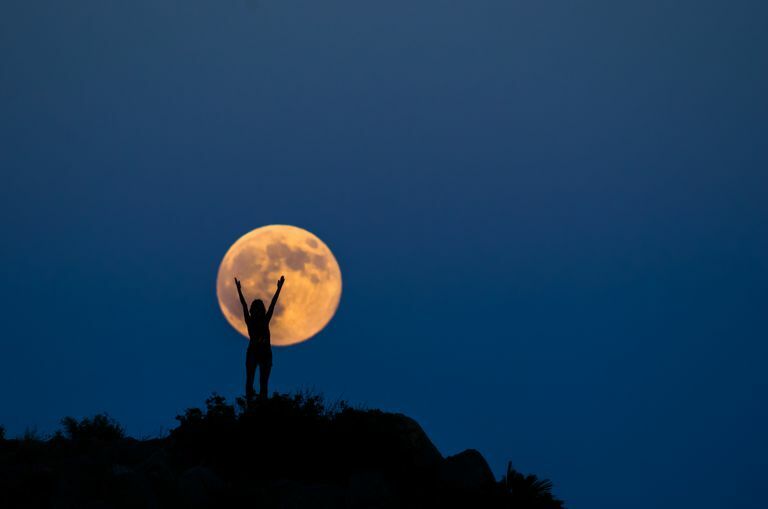 A full Moon ritual might involve taking one solid step, with symbolic action. And it can be a powerful time to release, cast out, unburden yourself, purge, etc. You celebrate your emergence by stepping out of old skin, identity, behavior, attitude, relationship. The ritual helps you by marking this inner transformation in a formal way. A full Moon ritual might involve purification by one of the elements. Most often, it's fire and done by casting something you don't want into the flames. One idea: 1) Write what you're releasing down on a stick. 2) resolve to let go as you throw it into the fire. 3) Throw the stick into the fire. This can be done as a group, with everyone sitting 'round the fire...or in your own private ceremony. Each person can seal their action of letting go by speaking it aloud if there's trust in the circle. Water can be used to cleanse in rituals. I remember a very meaningful full Moon ceremony I had at my house with three other women. We had filled a blue bowl with water and some rose petals. Each of us wrote down what we wanted to draw into our lives on a piece of paper. After we read them aloud, we put our hands in the bowl to signify the cleansing of the old, to open to the new. It's still one of my favorite memories. Mainly it worked because we all trusted each other to be open-hearted and share our dreams. When that's there, you can evoke the magic of shifting consciousness at will because the support is palpable. Create sacred space with candles, sage smudging, and setting up altars with powerful totems. For some rituals, I'll use an owl's wing that a friend gave me, to represent wisdom. Each person writes what they're releasing on the floating candle. It's not important that it shows up, just that the intention is there. As you place the candle into the bowl, declare what you're releasing. Allow yourself to feel the transfer of what you're releasing to the candle. As a group focus on letting go into the water, holding hands if that feels right. Allow the candle to keep burning in the bowl as a symbol of the letting go process. The flame is a purifier and symbolizes the sparks of inspiration as well. If you blow out your floating candle, and your bowl is in your home, relighting it will remind you of your commitment. Place inspiring pictures and totems around it that remind you of who you're becoming. Above all, give yourself kudos for honoring your own growth.